Sweet, smooth, creamy and full of fresh blackberry flavor! Summer just got a new favorite treat... blackberry ice cream! My husband is one of those (crazy!) People who could do without sweets. In most instances he would just assume have another helping of meat than save any room for dessert. He is also one of those (even more crazy!) people who's appetite is directly linked to his activity output for the day and therefore maintains a pretty darn steady weight all of the time, but that's a complaint for another day! One of the few desserts that he is almost guaranteed to save room for is MiMi's homemade ice cream. She gets in trouble if she doesn't give fair warning before dinner that there will be ice cream on the other side. He needs to know ahead of time to save room for a giant bowlful! So when we were planning the menu for the hog roast, he chimed in with ice cream! No surprise there, and a perfect summer treat. Then he narrowed down the request to blackberry ice cream. MiMi and I generally aim to please when it comes to planning a menu, so she was ready to accept the challenge. The only problem was her blackberry bushes weren't producing berries yet. So little dude, his daddy and I picked a bunch of berries for MiMi. I know I've said it before, but our little berry patch produces the biggest berries I've ever seen and we tend to get berries a little earlier than everyone else too. I don't know if it's the variety (they're thornless canes) or the fact that they are against a brick wall and get some radiant heat. Maybe it's a little bit of both. Either way, we've had a chance to eat our fill. We've had them in smoothies and I've made a blackberry crisp. Plus there are two gallons of berries in the freezer for this winter. I love baking with them, but turning on the oven will sound a lot more pleasant a few months down the road! With our berry stash in good shape, we didn't mind sharing. Especially if it was to make the ice cream we requested! MiMi sent us pictures along the way, so the excitement was building to taste it. The amount of berries we brought her filled up her ice cream maker perfectly. Her base was beautiful and we couldn't wait to dive in. We jostled the menu a bit as the days wore on and ended up serving this, some vanilla ice cream and the rolo poke cake for the birthday celebration instead of the hog roast. Everything was so good, but this ice cream got the biggest reaction. It was so full of blackberry flavor and perfectly creamy and delicious. I have a feeling it will become a summertime tradition! MiMi wanted to share her two cents too, since she was the one who made it! When Matt asked me to make blackberry ice cream for 4th of July weekend I really wanted to get it right. Carlee loves to freeze blackberries to use in recipes throughout the year. 2 quarts of them is a treasure so I needed it to be really special. Judging by the reactions, I'd say I was successful. Pops told Matt that the extra ice cream stays here. Matt promptly offered to stay here and finish it off the next day. The guilties got to Pops so he brought Matt the carton the next day. In a large saucepan, cook down berries with lemon juice and 1/4 cup sugar. You'll want to cook them over low heat for about 20 minutes. Then strain the liquid to remove the solids. Be sure to press down on the solids to extract as much juice as possible. Discard the solids and set the liquid aside. In a small saucepan, heat the half and half and remaining sugar over low heat until the sugar is dissolved. Remove from heat. In a small bowl, whisk egg yolks until they are thick and pale. Slowly temper them by drizzling in a bit of the hot half and half, whisking as you do. Once you have added about half of the half and half mixture to the egg yolks, return the egg yolk mixture to the saucepan. Heat over medium-low heat, stirring constantly, until the mixture thickens like custard. Strain any clumps out if necessary. Stir in the cream and the blackberry mixture, then chill. Once cooled, add to your ice cream freezer and freeze according to the directions. Once churned and frozen, place in freezer for at least a couple of more hours to firm up. Oh Carlee, not only is this a delicious soundinding ice cream but it's so pretty! Blackberries are my husbands fav and our dog Daisy's. I so want to try this, so refreshing and creamy I bet! This would be perfect then! It really is sooooo good. Blackberries get a mixed reaction with my family because of the seeds, but this way you get the flavor without any of the seeds! Carlee, your berries really are the biggest blackberries that I have ever seen. I am jealous. The ice cream looks fabulous (Kudos to Mimi). Blackberry smoothies and blackberry crisp, all sound so wonderful. I could totally go for some blackberries. I am in awe of your husband for not loving sweets - he sounds like a smart guy. My sense of taste, loves sweets and it usually wins out over the wisdom of my brain telling me that sweets are not the best thing for me. 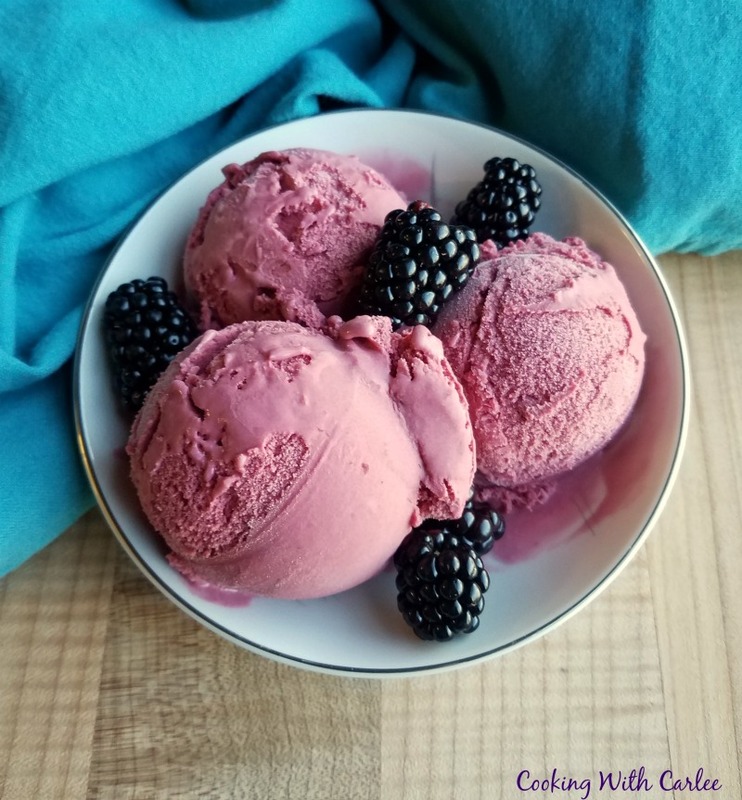 Thank you for sharing this wonderful recipe for Blackberry Ice Cream. You know I am making this, right? I have berries in the freezer I need to use before this years harvest is ready to pick, and I know that the family would love this! By the way, I guess as much as our husbands are alike, this is their big difference... Mine could never give up his sweet! He always saves room! Is this perfect timing or what? Blackberries just came into season in my area last week. Definitely adding blackberry ice-cream to my dessert list to make soon. PINed it! It's meant to be! I hope you love it! Those blackberries ARE monsters! Holy cow! Mimi and I think alike - some foods are treasures - and that ice-cream looks incredible! It was definitely worth giving her some of our berries for this ice cream! Luckily I still have some in the freezer for some winter baking! Those are enormous! That ice cream looks SO good! Aren't they crazy? It really is some good ice cream. Thank you! That looks absolutely delicious! I love blackberries and in homemade ice cream it must be fantastic. Thanks for sharing at Friday Frenzy this week! It really is a perfect summertime match! Thank you! Isn't the color great? Thanks so much, Shirley! Your husband sounds pretty rude with that steady weight nonsense! ;) My husband is the same about sweets, he can very easily pass them up. 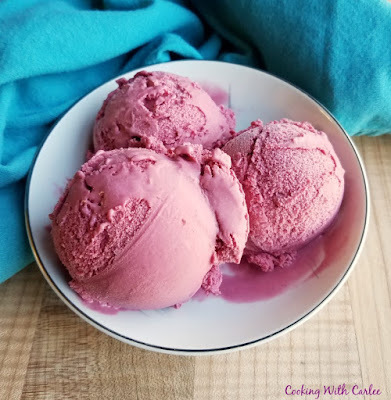 This blackberry ice cream looks so creamy and delicious! Pinning for later. It is totally rude, isn't it?! I hope you enjoy it! This recipe looks simple enough to make, I love the idea of using fresh fruit. 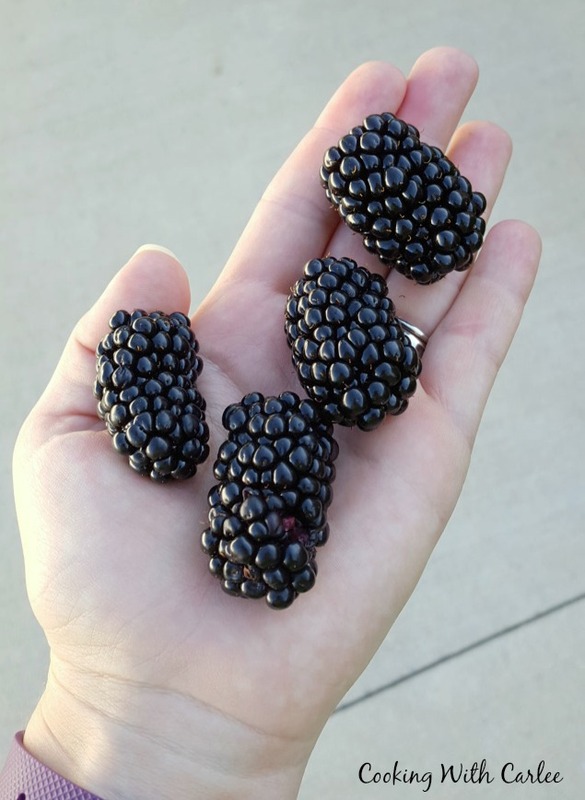 It is a great way to enjoy blackberry season! If I don't quit seeing this ice cream on these link parties, I am going to have to come and see you and have you make me some! Ok maybe it would be easier to just make it myself, but I'm thinking that it wouldn't be nearly as much fun!!! You should totally come and have ice cream! Head this way! My daughter just asked about picking blackberries! and she has an ice cream maker.. so.. Thanks for sharing at our Celebrate 365 Blog Parties, Farmers Market Recipe Collection! Then it sounds like fate! This one was an instant hit with our family! Hi I want to try your recipe. I had a bumper crop of blackberries so cooked down berries and strained the purée. So how much is2 quarts cooked and strained for your recipe?i have many containers with the purée. I would start with a 2-3 cups. I think as long as you are close it would work. The only worry I could think of would be going too far overboard could make the ice cream a little grainy because of the water content. I hope you love the ice cream as much as we do, it is definitely one of our favorite ways to use our berries!